What else can be more fun for a Family Thanksgiving Day than walking through the park and spending happy time together? 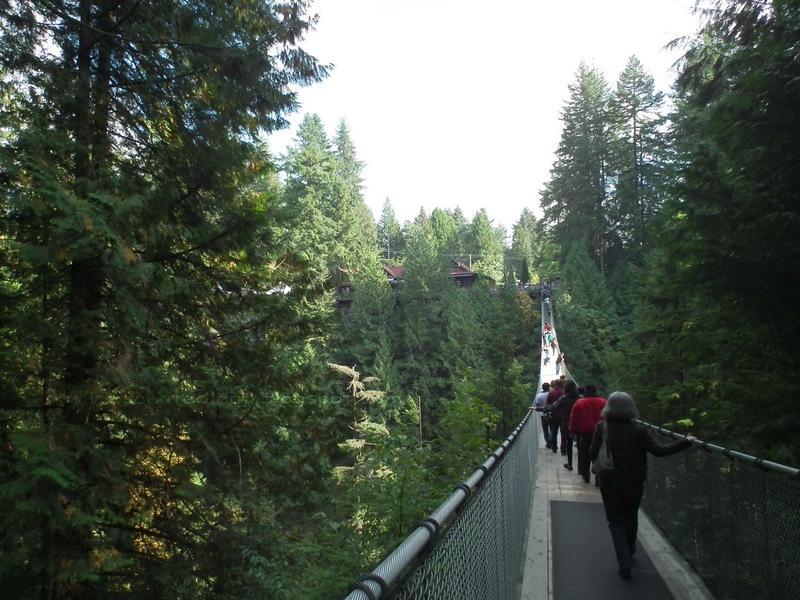 So, we spent this day walking again to the spectacular bridges and rainforest-ways built at Capilano Suspension Bridge Park. 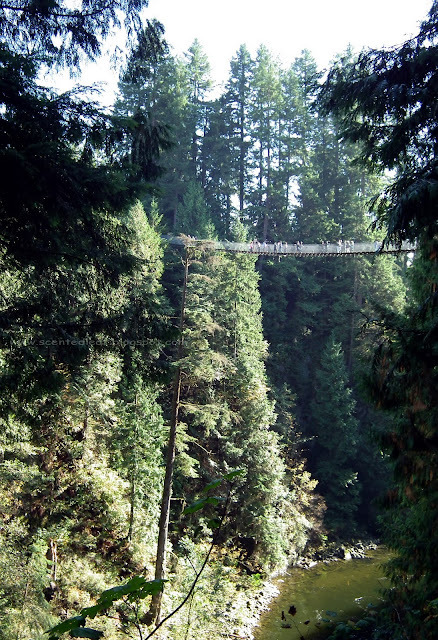 Started as a simple bridge made in 1889 of hemp ropes and cedar planks, the bridge was upgraded many times over the years, nowadays being a very sturdy one, made by steel ropes anchored by concrete stairs at both ends.
" The bridge is 230 feets(70m) above Capilano River. 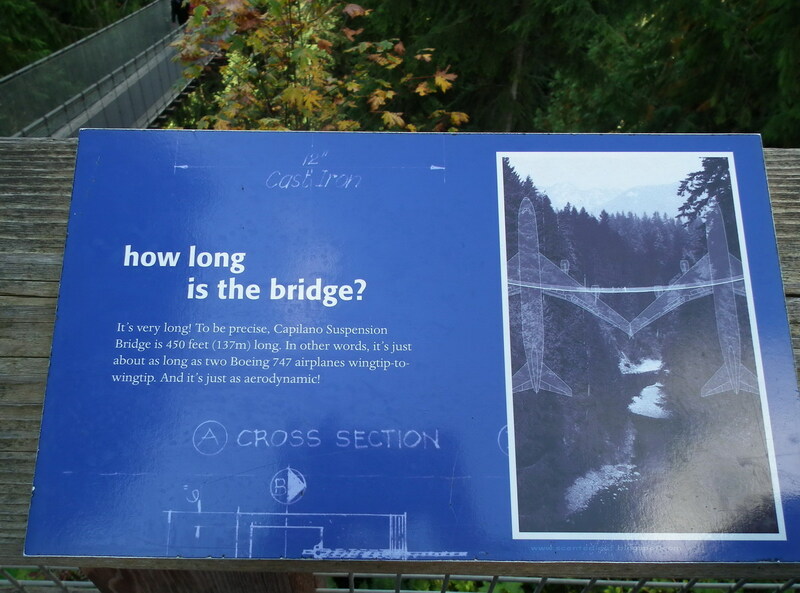 This means if dinosaurs still ruled the earth, it would take a stack of four full-sized Tyrannosaurus Rex to reach the bridge from the river. Yikes! 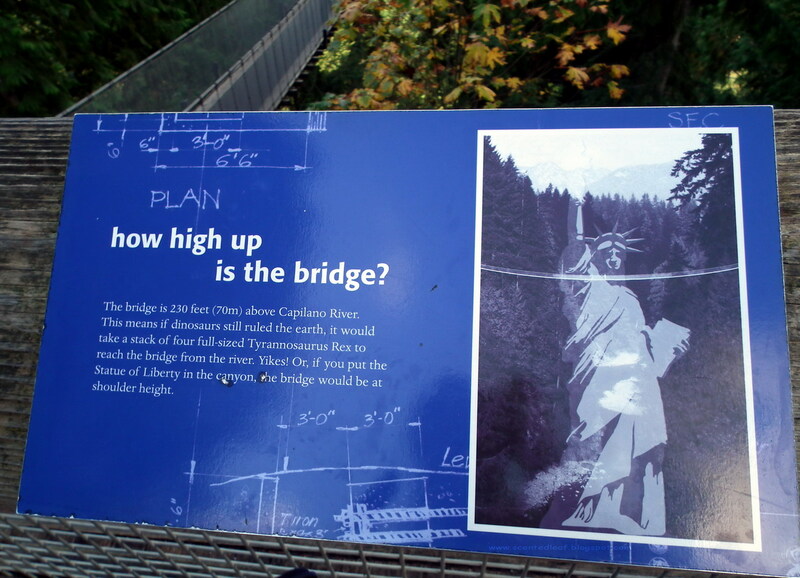 Or, if you put the Statue of Liberty in the canion, the bridge would be at shoulder height." 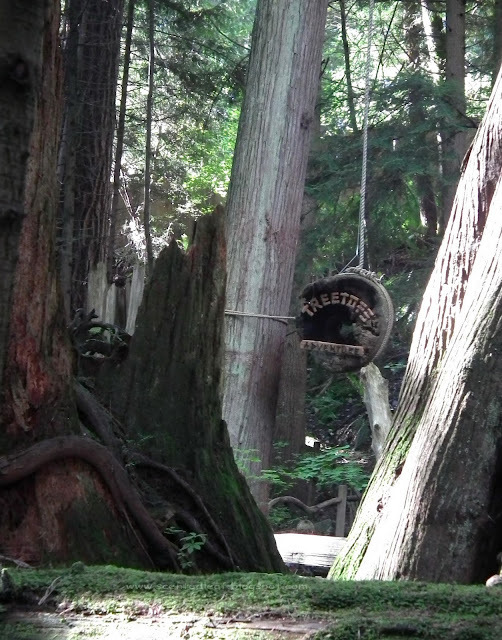 "It's very long! 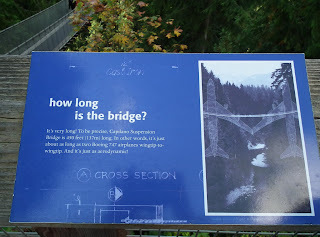 To be precise, Capilano Suspension Bridge is 45 feet (137m) long. In other words, it's just about as long as two Boeing 747 airplanes wingtip-to-wingtip. And it's just as aerodinamic!" 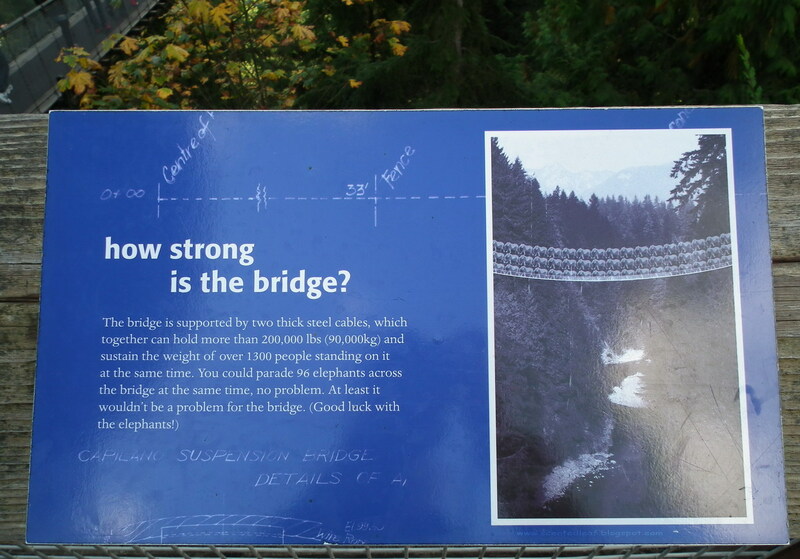 - "How strong is the bridge?" 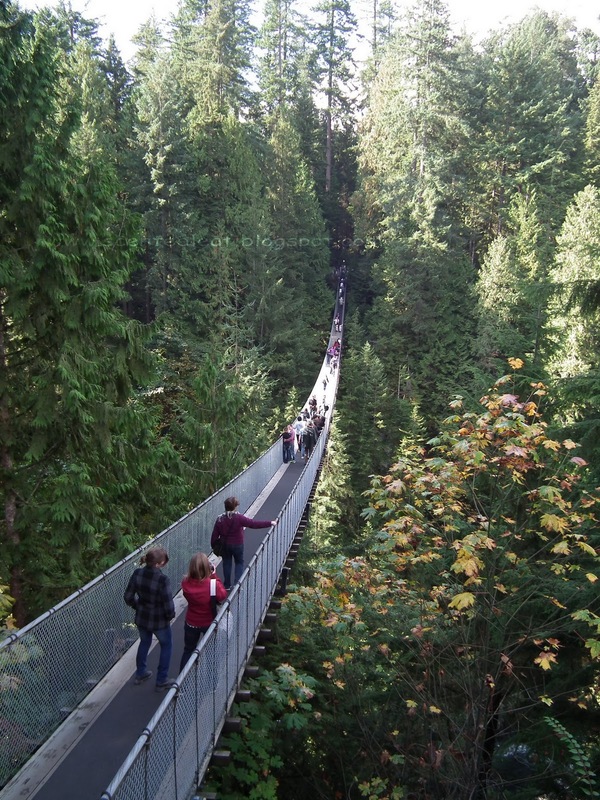 " The bridge is supported by two thick steel cables, which together can hold more than 200,000 lbs (90,000kg) and sustain the weight of over 1300 people standing on it at the same time. 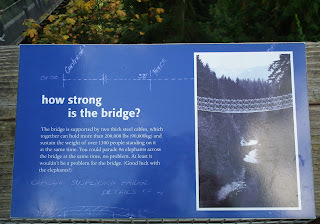 You could parade 96 elephants across the bridge at the same time, no problem. 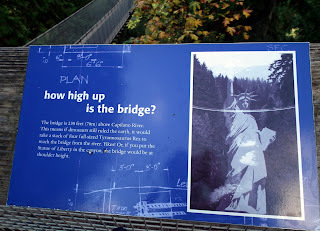 At least it woudn't be a problem for the bridge. (Good luck with the elephants!) 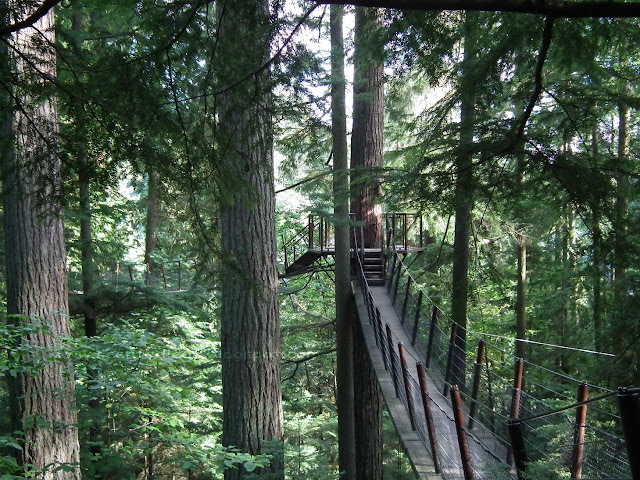 "
Our way continued with the "Treetops Adventure" along the rainforest trails where we breathed a sigh of relief as we walked high in the Hemlock, Red Cedars and Douglas Fir trees (enjoying their scent) to a series of suspension bridges above the forest floor. Around the trees trunks were built various observation decks without damaging the tree in any way. 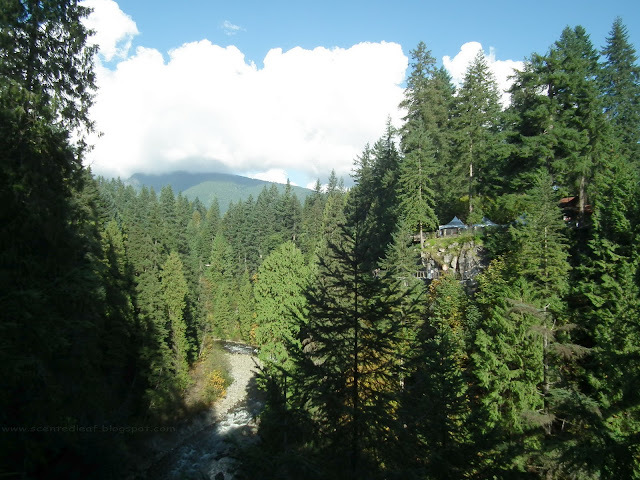 Overall, we and the kids really enjoyed our walking through Capilano Supension Bridge Park and the views of forest, the Canyon and the Capilano River were really amazing. What an amazing bridge and a gorgeous view! I have to admit that the first photo makes my heart start to pound a little bit, though... 230 feet is really high!